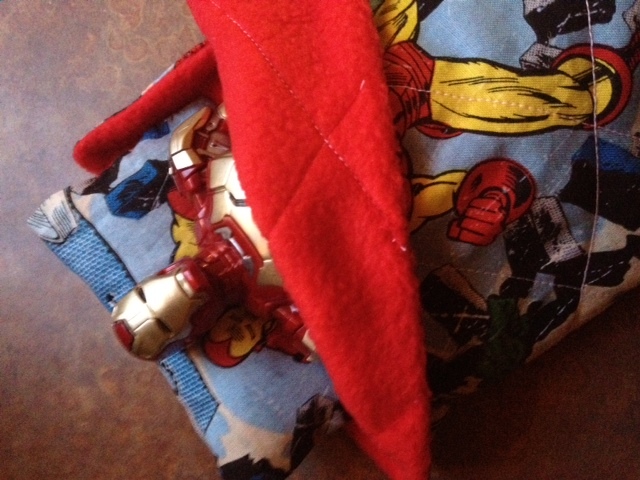 So … my grandson loves Iron Man. I would prefer him to still be content with Mickey and Minnie, but he’s moved on, and in a big way. 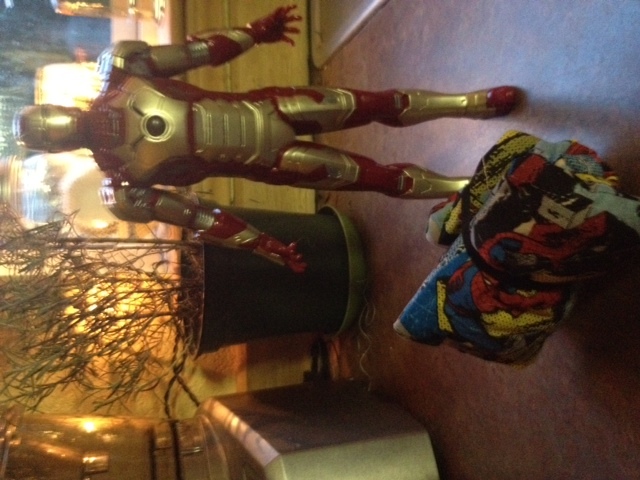 Almost every day, he asks, “Can we go to Target and look at Iron Man?” This, while clutching his big and little Tony figures, and wearing the Iron Man sweatshirt his Aunt Tera gave him for his birthday … where he ate a Marvel comics birthday cake under Marvel comic banners and posters. Surrounded by super hero gifts of all shapes and sizes. The boy has it bad. I have my limits. We don’t watch the movie when he’s here (way too violent for my conscience), nor do I download Iron Man or super hero apps on my laptop for him, although I know they’re out there. Sometimes we let him browse google pictures of Iron Man, but after a few minutes, I try to distract him with “Grandpa’s Workshop” or “Grandma Loves Bugs” (two of our favorite apps). 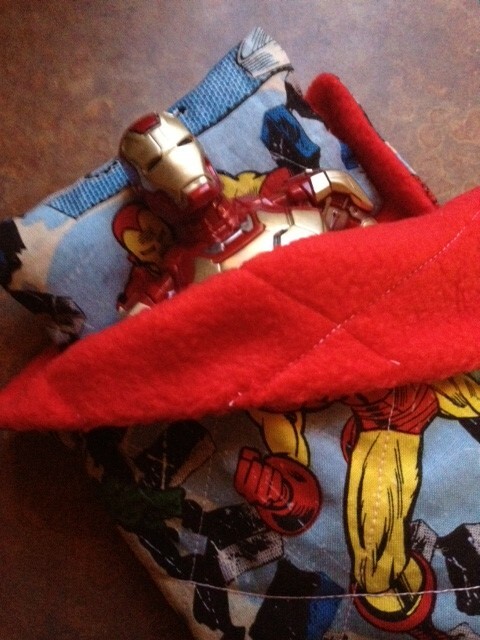 When Gage received a sleeping bag for his birthday, I couldn’t help but make a sleeping bag for Iron Man. 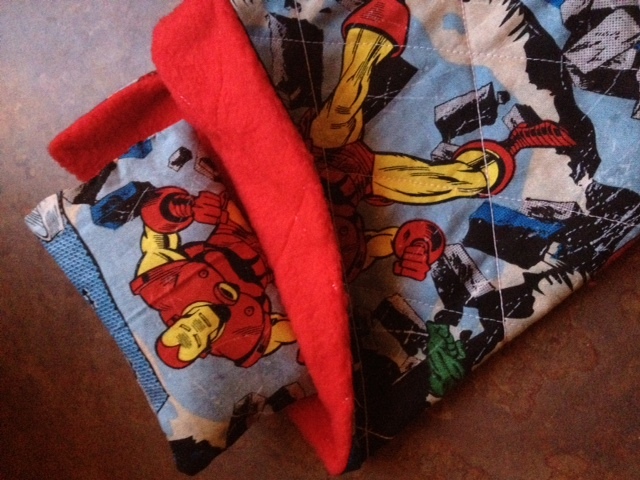 Back when Gage’s daddy was a little boy, I made a sleeping bag for his G.I. Joe, so it seemed right to carry that on with Gage. Maybe you have an action-figure lover in your house. If so, here’s an easy way to keep him warm at night. Measure the action figure for height and width (at its widest point, which for Iron Man was his arms) and add a half-inch to the height. To the width measurement, double that and add two inches. This will account for seams and for roominess for the figure itself. So again, you’ll be cutting a cover and a lining that is the height of the doll plus a half an inch, and twice the width of the doll plus two inches. Still with me? 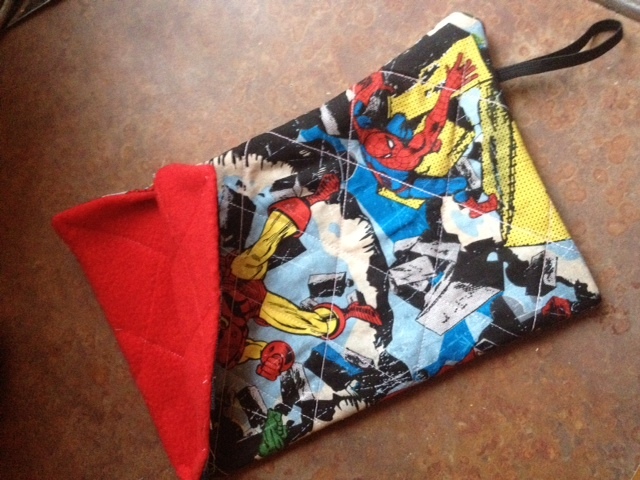 With fabric folded right sides together (the pretty part :)), cut a cover and a lining that is the measurements you came up with above.Here’s the cover and lining I used. The cover is twice this width; the picture shows it folded over. With those pieces still right sides together, pin all around. 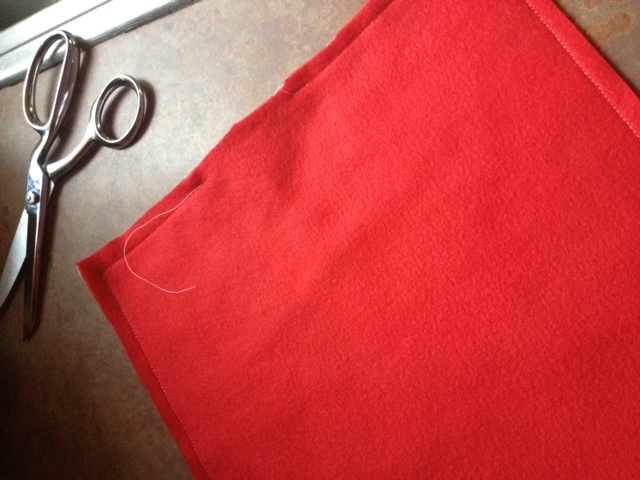 Starting a few inches from the bottom on one of the shorter ends, begin sewing all around with a 1/4 inch seam. Don’t completely close it up. 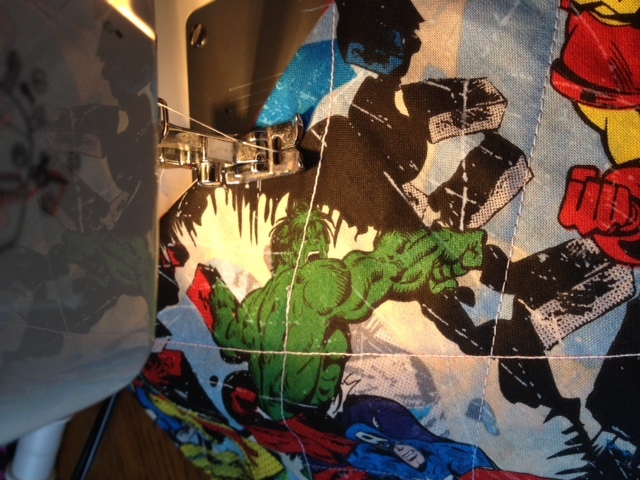 Stop sewing about three inches from where you started. 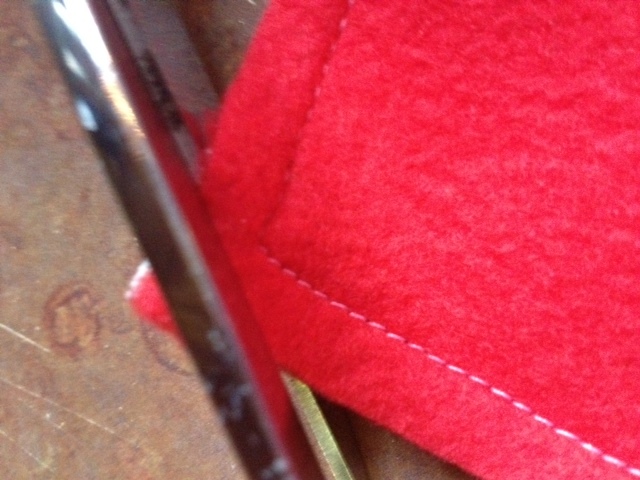 Cut the thread, then cut diagonally across each corner, being careful not to cut into the threads. This will reduce the bulk on those corners. Turn the piece right sound out, pulling it through the hole you left on one side. 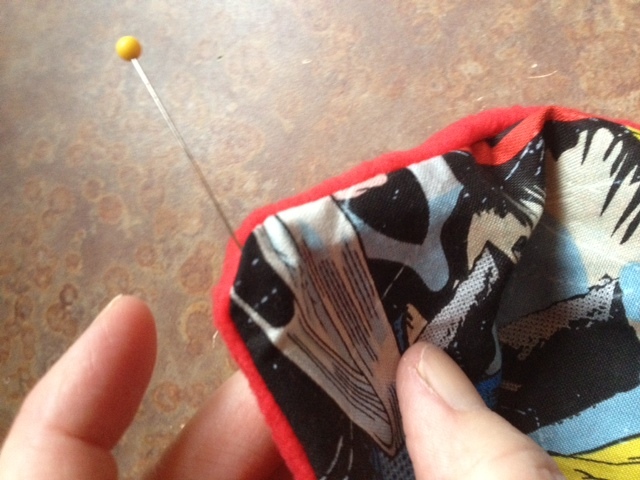 Tucking the seam down inside, pin together the opening you made. 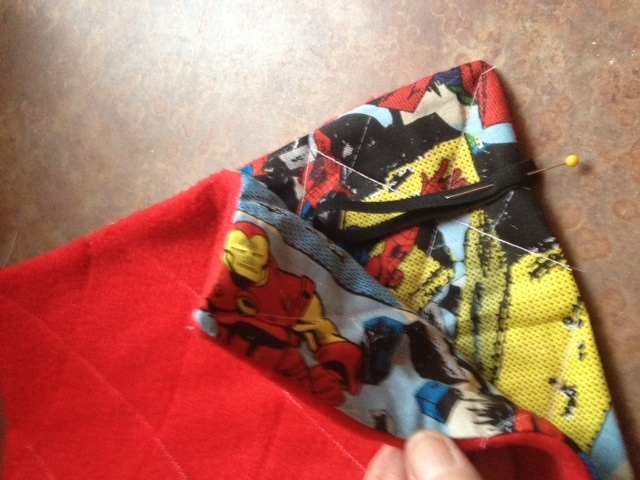 With a pin, tug at the corners to pull the fabric out to a nice point (otherwise, you will have rounded corners). At this point you may want to iron the sleeping bag lightly. With your corners tugged out and the opening pinned shut, begin top-stitching all around the piece very close to the edge. This will give it a nice finish and close up the opening all at the same time. To quilt the sleeping bag, top-stitch from the top left corner down to the bottom right corner, and then from the top right corner to the bottom left corner. In this way you will have made an “X.” Now just top-stitch parallel lines in both directions. I used the edge of my sewing machine as my width. 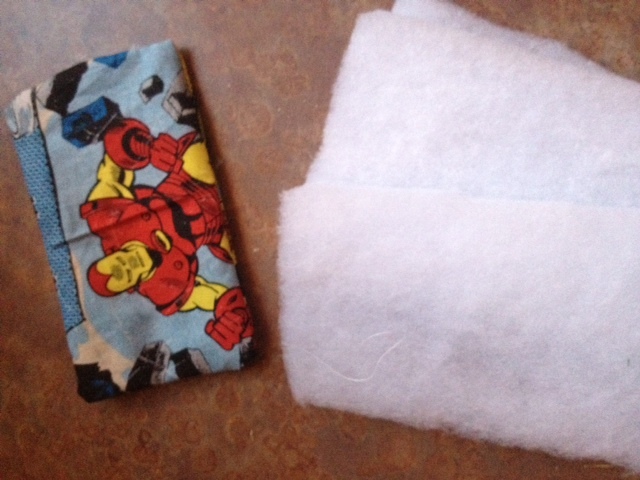 Once you’ve quilted the pieces together and trimmed all the threads, decide how Iron Man (or whoever) will be rolling the bag up. 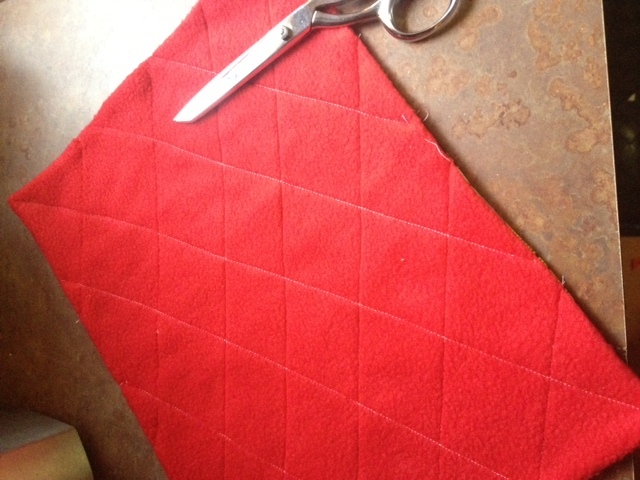 If it will just be folded once, mark the center of the fold with a pin at the bottom. If it will be folded twice, mark the center of that one quarter along the bottom. I opted to have it folded twice, so I made my mark closer to one edge. Now fold your sleeping bag in half, right sides together, and making sure the elastic loop is still tucked up inside the bag. Starting about three inches from the top right edge (not the folded edge, but the “raw” edges … although they’re not raw, but hopefully you know what I mean), begin sewing all around the sleeping bag with a stitch that is very close to the edge. Be careful that you get both pieces of fabric within this stitching. 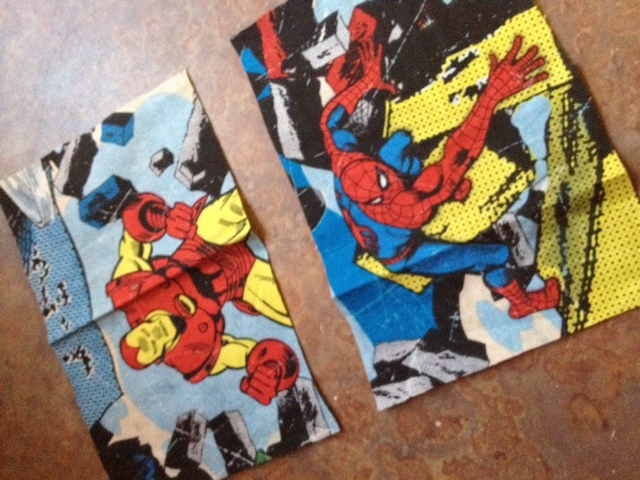 You want to leave that one corner open so you can fold it down after your super hero gets inside. Trim the thread, turn it right side out, and … voila! 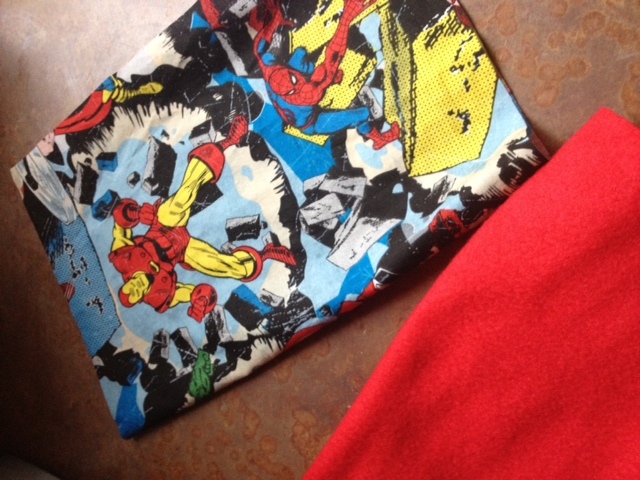 I chose two pieces carefully because I wanted both Iron Man and Spider Man faces on the pillow. That way Gage can flip it back and forth. To measure, I just eyeballed how big I wanted it to be. It’s just a little less than the width of the sleeping bag minus the seam allowance. 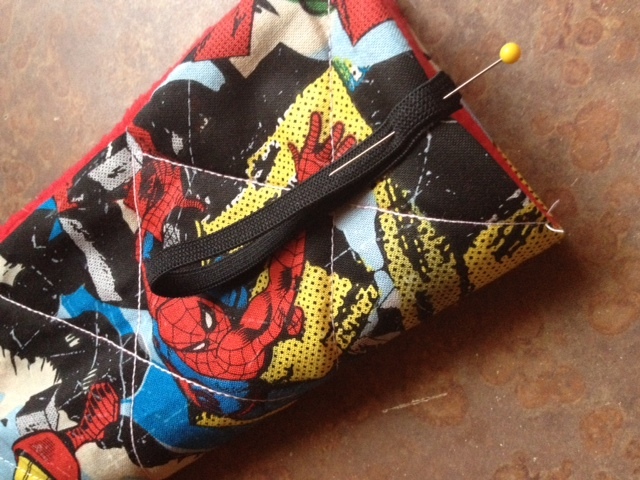 With right sides together, sew exactly as you did the first two pieces of the sewing bag, meaning that you will start on one short end, go all the way around, but stop an inch or so from the beginning so you can pull it right sides out after. 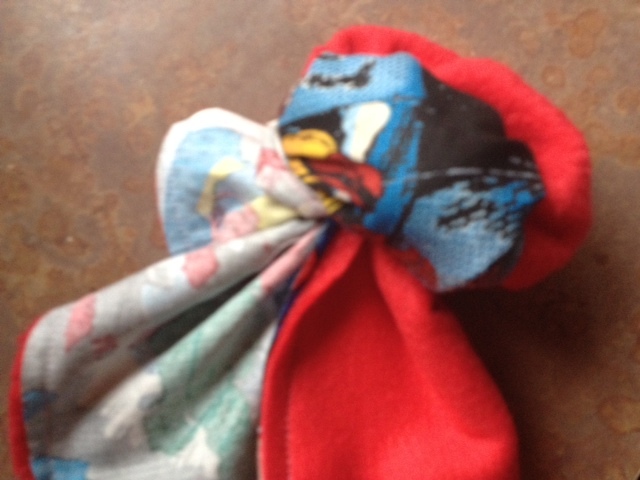 Turn it right sides out, stuff with batting or old scraps of fabric or cotton balls (whatever you have on hand), then pin the opening closed and whip-stitch it together by had with matching thread. You didn’t know super heroes camped, did you.